An effective quarterback can have a very big impact on a college football team - far more of one in the NFL. Because college football players are less experienced and more errors are made there is a lot more room for a standout player to lift his team and have a positive impact on the way things turn out. By now even casual college football fans have heard a lot about the guys who are expected to be big-name, potentially award-winning quarterbacks this year. B.J. Daniels, South Florida - Last year Daniels wasn’t expecting to see much action because he was backing up a very good QB in Matt Grothe. Grothe got hurt in the third game of the season and was out for the year, so Daniels was forced into action early. He thrived under the pressure. Daniels is a guy who is as happy running as passing, and the stats showed - he threw for 1,983 yards and 14 TDs with nine interceptions, and he ran for 772 yards and nine more scores. Now Grothe is a year older, he’s considerably more confident and prepared, he’s physically matured and is stronger, and he has a much more stable coaching situation to work under. There aren’t that many dual-threat quarterbacks with more potential this year than Daniels. 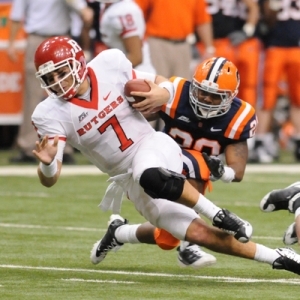 Tom Savage, Rutgers - Daniels is the best QB in the Big East in my eyes, but Savage isn’t far behind. He took over half way through the season last year despite being a true freshman. Everything wasn’t perfect, but he threw twice as many TDs (14) as interceptions, and there was a whole lot to like. Savage is a very hard worker, and he has been very committed to improving since last season. Savage has a very nice arm, and he’ll be allowed to show it off more this year. Zach Collaros, Cincinnati - I’m not generally a fan of the Big East this year, but I’m clearly fond of their quarterbacks because this is the third one in a row. Collaros was brilliant in relief of Tony Pike last year when he was injured, and now he has the chance to make the team his own last year. A lot is being made of the fact that Brian Kelly is no longer with Cincinnati, but that doesn’t particularly concern me. Kelly is a very good coach, but so is new coach Butch Jones, and he ran a very potent offense at Central Michigan - where he also took over for Kelly. Collaros has the chance to put up some serious numbers this year. Scott Tolzien, Wisconsin - There are some high hopes for Wisconsin, but Tolzien gets little of the attention. He deserves more. The senior is an abnormally intelligent player that is masterful at avoiding mistakes and playing within himself. He’s accurate, he gets rid of the ball quickly, and he’ll have a lot to work with this year. The biggest tool in his toolbox is running back John Clay. Clay is a total beast, and he’ll open up a lot of opportunities for Tolzien to shine. Diondre Borel, Utah State - Kellen Moore gets all of the attention in the WAC, but if it weren’t for him then Borel would get more attention. He’s entering his third year as the starter, and he has shown solid steps forward each year. He is accurate, and he throws a lot while avoiding interceptions - he threw 17 touchdowns and just four picks. He is a threat to run as well. Borel is a guy who can score on a team that is going to be a lot better this year than they were last year. Trevor Vittatoe, UTEP - Mike Price has the best team that he has ever had at UTEP, and Vittatoe is a big part of the reason. This is a big guy, and he’s put up some big numbers. The senior has started for three years already, and he has passed for more than 3,000 yards each year. His arm is a rocket, and his yards per attempt are very solid and consistently improving. He has a nice offense to work with, so I expect some fireworks. Ryan Lindley, San Diego State - Coach Brady Hoke is in his second year at San Diego State. He showed a lot of progress in his first season, and I expect another big step forward here. Lindley, a junior, is in his third year as a starter so he is well seasoned. Despite adjusting to a fundamentally different offense last year under Hoke - a pro-style offense - Lindley threw for 23 touchdowns and more than 3,000 yards. Now he knows the offense much better, and unlike last year he should have a running game to help ease up the pressure on him, so Lindley could do something special. Doc’s Sports has become known in nearly four decades in the sports handicapping business as one of the brightest and most successful college football handicappers in the nation and Doc is primed for one of his best years ever in 2010-11. Here ay Doc’s Sports we provide both college football picks and NFL picks in one package so you can get the best of both worlds for all your football betting needs. Check our homepage for up-to-the-minute college football odds and daily exclusive college football betting articles.